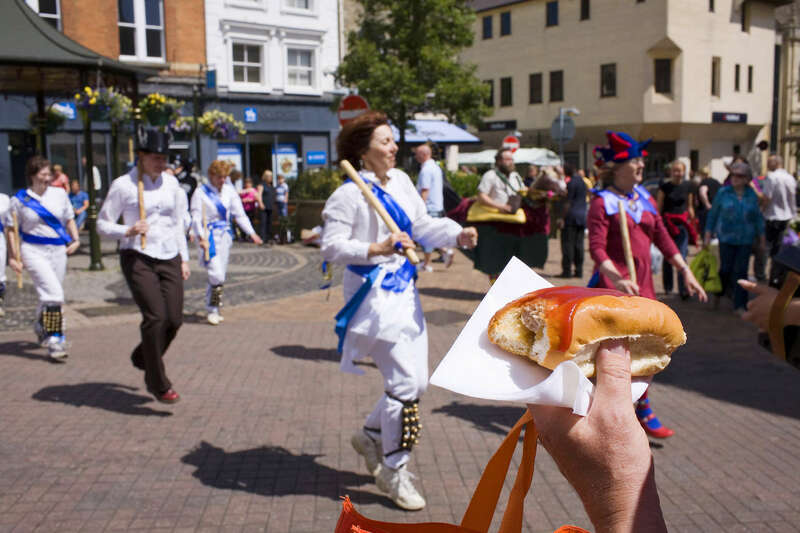 A man with a hot dog watches Morris-Women perform in Banbury town centre as part of the Hobby Horse festival. A hobby horse is a puppet-like costume giving the wearer the appearance of a man with a horse. For centuries hobby horses, Jack in the Greens, straw men and other characters brought life and colour to civic processions in towns and cities across the country, many of them can be seen in carvings in local churches. The Oxfordshite town of Banbury revived the tradition of a procession through the town in 2000. Banbury's history goes back to Anglo-Saxon times. An earlier charter from Queen Mary in 1554 had officially established Banbury as a town.